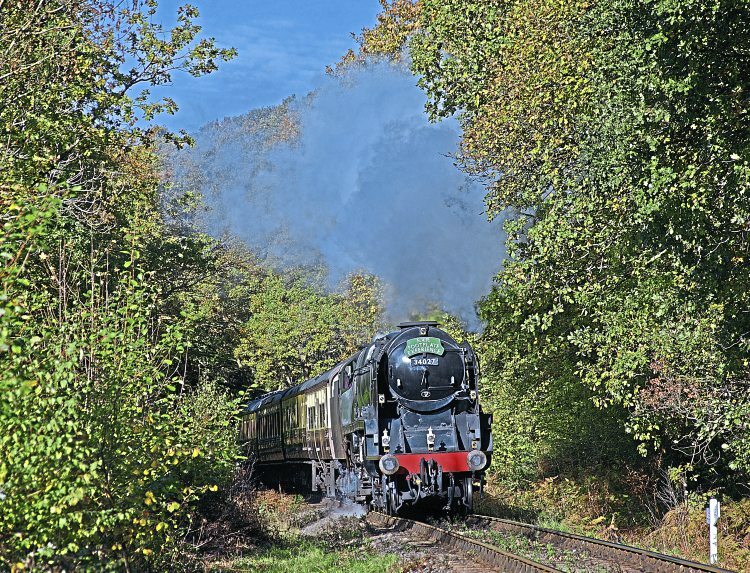 No gala – no visiting star guests – it was just the home fleet in operation on the Severn Valley Railway, but amidst some of the most wonderful autumn colours we have seen for many years. After the long hot summer when steam was banned many times throughout the country because of fire risk, trees had started to change their colour in late July. Due to the tinder dry and drought conditions, this change was much earlier than normal. It had been very slow for the autumn colours to fully appear, but when they did the result was stunning, particularly in the scenic Severn Valley. Bulleid No. 34027 Taw Valley climbs through the woods towards Orchard Crossing with a footplate experience train on November 2. During school half-term week, between October 27 and November 4, the Severn Valley Railway was running a daily three-train service using two steam locomotives and one diesel, with an additional steam footplate experience and dining train. Many other lines were also running during the week, but not with such an intensive service. In operation were Bulleid West Country light Pacific No. 34027 Taw Valley, GWR 2-8-0 No. 2857, Ivatt 2-6-0 ‘Flying Pig’ No. 43106 – all facing south – plus the Class 40 No. 40106. For the first time in many years after its return from the North Yorkshire Moors Railway gala, No. 2857 was delivered facing the opposite direction. Read more and view more images in Issue 249 of HR – on sale now! Next Post:New Churchward County – now a reality!